Is there any reason to still care about the Dow? Here’s the chart of yesterday’s price action in the Dow, the S&P 500, and the Nasdaq. Note anything crazy? 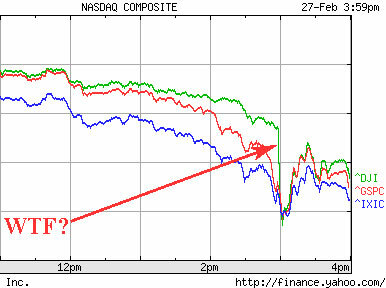 Like a whopping great big down-250-points-in-one-tick plunge in the Dow at about 3pm? In other words, a computer glitch. So to the obvious question: Can someone please just take the Dow behind the shed and shoot it, already? It’s an average, not an index, which makes it profoundly useless for measuring what stocks in general are doing. It comprises the grand total of 30 stocks, which makes it far from representative of the broader market in any case. And, as we saw yesterday, it can’t even calculate itself reliably. Is there any purpose for this anachronism whatsoever? UPDATE: The WSJ (published by Dow Jones, whose computers went FUBAR yesterday) has a very good, and free, overview of what went wrong. 10 Responses to Is there any reason to still care about the Dow? Years ago, of course, the benefit the Dow had was that it was easy to calculate. These days, if I had to make a case for it, my first attempt would be that, with fewer components, on a particularly heavy trading day, it might be less prone to technical glitches. Rather, that would have been my first attempt 36 hours ago. Tonight, I guess I’m stumped. one day i went shopping outside,and in an ed hardy store,I found some kinds of ed hardy i love most they are Your website is really good Thank you for the information Ed Hardy Mens Hoodies Ed Hardy Mens Hoodies Ed Hardy Mens Jeans Ed Hardy Mens Jeans Ed Hardy Swim Trunks Ed Hardy Swim Trunks Ed Hardy Womens T-Shirt Ed Hardy Womens T-Shirt Ed Hardy Womens Tops Ed Hardy Womens Tops Ed Hardy Womens Hoodies Ed Hardy Womens Hoodies Ed Hardy Womens Shoes Ed Hardy Womens Shoes Ed Hardy Belts Sale Ed Hardy Belts Sale Ed Hardy Men T-Shirt Ed Hardy Men T-Shirt Ed Hardy Men Tops Ed Hardy Men Tops Ed Hardy Men Hoodies Ed Hardy Men Hoodies Ed Hardy Swim Trunks Ed Hardy Swim Trunks Ed Hardy Men Underwear Ed Hardy Men Underwear Ed Hardy Women Tops Ed Hardy Women Tops Thanks of your infomation i have read it is very help full for me. control over their mop of hair.